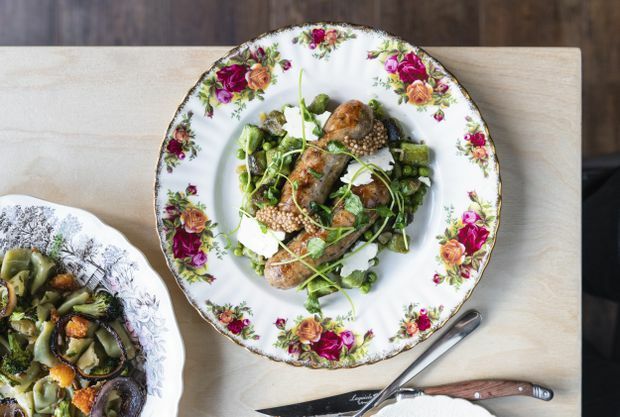 It hasn’t been the most dynamic year for the food scene in any major city across the Prairie provinces, but the lack of the “hot new” spots in Alberta, Saskatchewan and Manitoba is also surprisingly refreshing. It gives frenzied foodies and discerning diners alike a chance to catch their breath, catch up and perhaps even revisit restaurants that were wearing that trendy “new” hat just a year or two ago. Calgary had its most sluggish year of recent times in terms of restaurant openings. Edmonton, ever the dark-horse city in the Canadian food scene, also did not have a banner year, but its continued growth is undeniable. For a second year in a row, it has gripped more national recognition than its southern Albertan neighbour when it came to its restaurants. Winnipeg and Saskatoon both boasted a handful of new, buzzworthy eateries, as did Regina – at least one, anyway – but across the region, the proliferation of microbreweries easily eclipsed the number of openings of contemporary eateries. These 10 new restaurants of all shapes, sizes and (occasionally) offbeat approach remind me why I happily continue to call the Prairies home. Naysayers be damned as it is certainly much more than cattle, wheat and flat farmer’s field stereotypes. This year, I had help from writer Jenn Sharp for a few spots in Saskatchewan and Manitoba. A dish from Formosa Bistro in Edmonton, Alta. 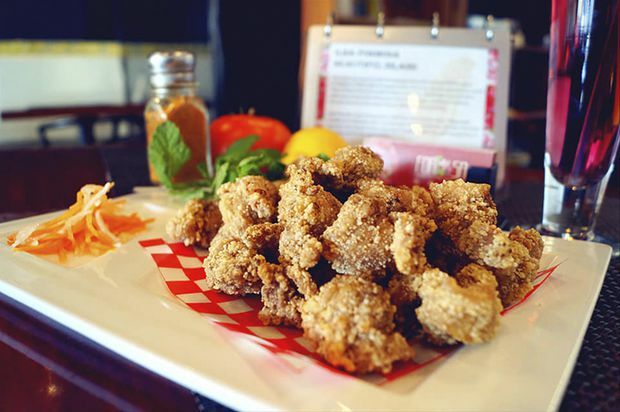 Edmonton’s Formosa Bistro made a delicious mark on 2018, bringing a taste of Taiwan to Alberta’s capital city and the food scene is all the better for it. Formosa offers a mix of staples from abroad, both of the traditional, home-cooked variety such as their rich, braised-beef soup with Chinese noodles, as well as dishes one might find strolling through an aforementioned night market such as the famous Taiwanese-style fried chicken. Taiwan’s most iconic dish, lu rou fan (pork belly braised in a soy sauce and Chinese five-spice mixture served over rice) also graces the menu and is a must-order for anyone unfamiliar with the depth of umami this cuisine can offer. Making Kale and bokchoy salad at Kanto 98 St. in Edmonton, Alta., on Wednesday, Sept. 26, 2018. At some point between tastes of tender baos filled with braised beef, tangy tomato sauce, shallots and red-pepper mayonnaise (the “Karabao”) or the forkfuls of sweet Filipino-style spaghetti, studded with hot dogs and bites of salty, crispy fried chicken, one needs to take a moment to appreciate how delicious and unique almost every single menu item at Kanto really is. Chef/owner Edgar Gutierrez, executive chef of Rostizado and Tres Carnales, passionately taps into his Filipino roots and cooks from the heart at this teeny fast-casual spot in Edmonton’s Chinatown to serve up his own take on traditional and street-food dishes he grew up eating in the Philippines. The result is a concise menus of skewers, baos and other dishes that offer up big, bold flavours and are easy enough to crave any day of the week. Raw GF bagel at The Moth cafe in Edmonton Alta. I hummed and hawed over the inclusion of Moth in this year’s best new restaurants feature more so than any other eatery. Perhaps it’s because the overall experience is fairly non-standard. A lengthy menu that includes anything from smoothies and “elixirs” to plant-based wine and cocktails (“mothtails”, get it?) or vegan interpretations of a myriad of traditional dishes, is overwhelming at a glance. Though once you give into the new-age-chic nature of things and let your dinner run its course, it’s easy to become charmed by the airy, yet warm dining room, casual, but earnest servers and food that is at most times fairly nonsensical, but quite tasty. 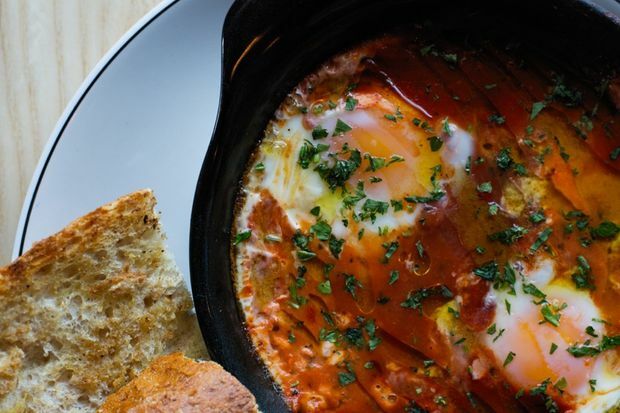 A dish of eggs and bocconcini is served at restaurant Pip in Edmonton, Alta. Charmingly simple at its base, this cozy restaurant just a block from Whyte Avenue serves as a reminder that an uncomplicated meal can still leave a lasting impression. Plates of tender meatballs wading in fragrant tomato and basil sauce, seared manchego served piping hot with fig jam and toast, or macaroni in an indulgent cheddar cream sauce topped with bread crumbs and thin apple slices, are certainly not set out to reinvent the wheel. A nice juxtaposition to Pip’s menu that’s brimming with comfort-food options (their eggs baked in tomato sauce with bocconcini is an especially lovely start to the day) is the restaurant’s modern approach to design that boasts a mix of triangular tiles both in front of and behind its bright wooden bar-top, among other things. Double Burger at Alumni restaurant in Calgary, Alta. Well-constructed sandwiches and cocktails served in a cool, casual atmosphere reign supreme in 2018. What I easily found to be the most refreshing and well-conceived concept of the year ticks all the boxes of what a person may look for in an enjoyable restaurant experience. This sandwich shop-meets-cocktail bar is all things approachable, inventive, fun and delicious. It doesn’t matter if you’re sitting down for the generously portioned beef dip with plenty of ooey mozzarella, mushrooms and rosemary au jus, or their subtle spin on a Nashville hot-chicken sandwich, nearly every sandwich here hits the mark (save the grilled cheese, admittedly). In the evening, sidling up to the bar for a well-made drink sees the daytime deli vibe head out the door, turning Alumni into a cool room for socializing with friends. Five ounce pours ready to be tasted at the Dandy Brewing Company in Calgary, Alta. With the exception of Edmonton’s Biera, one can be hard-pressed to find a place that produces both exceptional brews on-site as well as interesting food. In other words, a good brewpub is infinitely hard to find on the Prairies. Dandy delivers both. No stranger to the Canadian craft-brewing community, Dandy Brewing Company’s expansion from a small brewery into an interesting, local art-accented brewpub in Calgary’s Ramsay neighbourhood was easily one of the most wonderful things to happen to the city’s food and drink scene in the past calendar year. Smooth, rich chicken liver schmeared on toast, a creamy and appropriately broiled Welsh rarebit and Dandy’s signature hot dog with addictive, tangy house pickles are just a handful of the well-composed creations from chef Merritt Gordon. Kielbasa dish at Donna Mac restaurant in Calgary, Alta. In a year lacking in contemporary Canadian restaurant openings, this concept from the co-owners of Vine Arts and Proof, Jeff Jamieson and Jesse Willis, as well as industry veteran Amy Turner (which technically opened at the tail end of 2017) remains top of mind. Donna Mac’s elegant interior with floor-to-ceiling windows and playful finishing touches set the stage for a meal here, whether that means brunch, lunch or dinner. The teeny porcini and gouda crullers are one of the best dishes I have eaten in the country this year and the hearty kielbasa with dumplings is another comforting dish that lingers fondly in my mind. Two co-owners also operate some of the country’s top boutique liquor stores and cocktail bars, so it’s no surprise that whatever you wind up sipping here is nothing short of exceptional. Somewhat of an echo of Saskatoon’s Ayden Kitchen and Bar, the Grassroots Restaurant Group and its chef/owner duo, Dale Mackay and Nathan Guggenheimer, have found their formula for success in Saskatchewan: French- and Asian-inspired dishes that prominently feature Prairie-grown ingredients. Mr. Guggenheimer is primarily in charge of the menu and keeps things fresh and seasonal, incorporating local products into inventive dishes such as the pork-belly press (slow-cooked pork belly, gochujang, tamari, cucumber kimchi and sesame) are balanced against classic Saskatchewan-inspired ones, such as perogies with tender squash, garlic sausage, brown butter and aged gouda. Thanks to the group’s main bar manager, Christopher Cho, Avenue is now the top place in Regina for an interesting cocktail as well. Pork & morel sausage with parsley gnocchi & peas at Hearth Restaurant in Saskatoon, Sask. The good word about co-chefs and owners Thayne Robstad and Beth Rogers had spread long before Hearth officially opened its doors this past summer. In less than half a year, Hearth has become a go-to place to truly embrace Saskatchewan’s unique terroir through a dinner. The menu here features elevated comfort food prepared thoughtfully using plenty of the province’s celebrated ingredients such as chanterelles, foraged and preserved by the couple themselves and served in a rich cheese fondue, of sorts, with crostini. Serving pike conserva-style with citrus and chilies is a clever way to elevate the staple lakefish of the province. Fried 'risotto', faro, octopus, creme fraiche, romesco and basil at Passero restaurant in Winnipeg, Man. The newest eatery from one of Manitoba’s most celebrated chef/restaurateurs, Scott Bagshaw, finds itself adjacent to The Common at The Forks, an ever-bustling food hall, and offers up a calm refuge for a sit-down meal within its hectic surroundings. Distinct design accents made up of spaced wooden slats help Passero stand out from the pack. Dishes on the dinner menu such as the beef tartare with prosciutto “relish” and potato and parmesan crisps or the squid ink “risotto” made using faro before being fried and served with romesco, crème fraîche and tender pieces of octopus showcase the chef’s knack for reimagining approachable dishes. Corto, Passero’s daytime alter-ego, offers up an array of pressed sandwiches and vegetable side dishes that are more simple but memorable nonetheless.